Directions: Cook spaghetti according to package directions. Drain well and cool to room temperature. 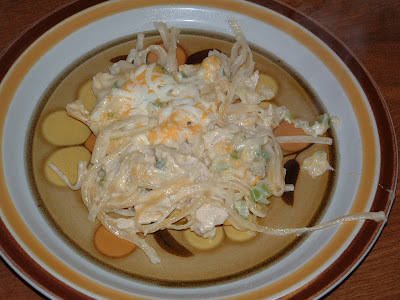 In a bowl, combine the spaghetti, Parmesan cheese and egg substitute. Transfer to a 9 inch pie plate coated with nonstick cooking spray and form into a crust; set aside. In nonstick skillet over medium heat, cook turkey, onion and green pepper until turkey is no longer pink; drain. Add spaghetti sauce; heat through. 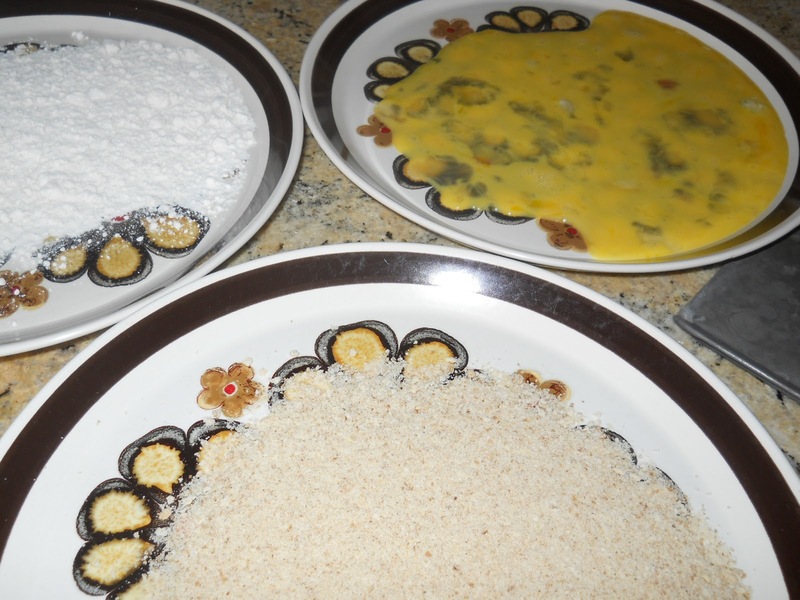 Spread cottage cheese over crust; top with turkey mixture. Bake, uncovered, at 350 degrees for 20 minutes. Sprinkle with mozzarella cheese. Bake 5 minutes longer or until cheese is melted. Let stand for 5 minutes before cutting. -I did not use a green pepper. -I did not use the shredded mozzarella cheese. Add the spaghetti sauce to the turkey to warm. In a separate bowl, pour the Parmesan cheese. 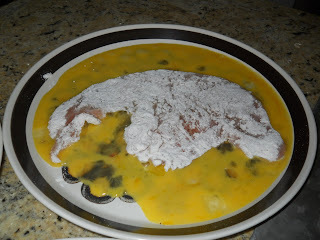 Add the eggs or egg substitute. Pour into a coated 9 inch pan. The cottage cheese really added an extra gooeyness to the dish but you could also substitute ricotta. 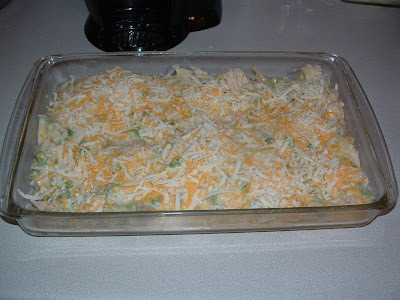 The 2 things I would do different is that I would add more sauce and I would mix everything together and then pour it into the baking dish. Other than that, I wouldn’t change a thing. I don’t often indulge in cheese. Even though I do so love it. I usually feel that you need a LOT of cheese in order for it to really taste good. I don’t usually indulge in that many calories, I usually choose to flavor my food in other ways. However, one does have to have cheese sometimes, right?? I tasted this before adding the cheese and after and it was delicious with the cheese. It still has a lot of flavor and the cheese brings it out even more! These were plenty flavorful on their own but I used some of my tomatillo green salsa to put on it. This made it even better! Seriously, this was a fantastic meal! Loved the leftovers the next day too! 1 can green chiles, 4 oz. 1 1/2 cups of cheddar cheese, 6 oz. Cook the ground turkey and the onions together. When the ground turkey is done, add spices, chiles and tomatoes. Let simmer for 10 minutes or until thickened. 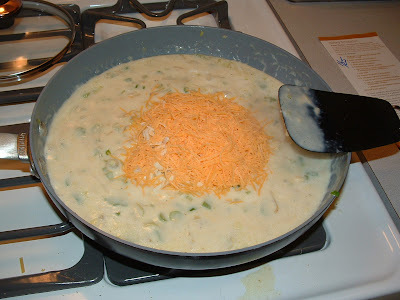 Turn off heat and add cheese and stir until melted. Put 1/2 cup of turkey mixture onto tortilla and roll and place seam side down in a pan. Spray tops with cooking spray and bake in oven for about 25 minutes at 400 degrees. 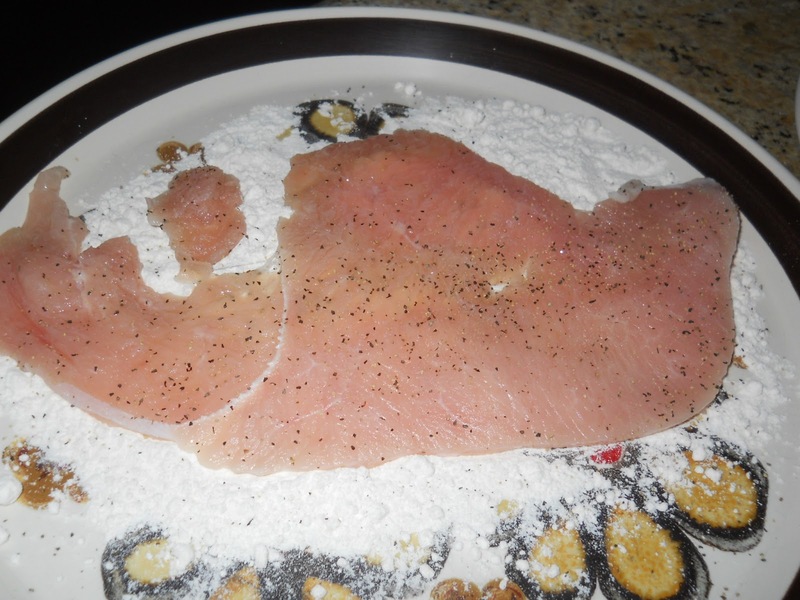 Generously season the turkey cutlets with salt and pepper and set aside. 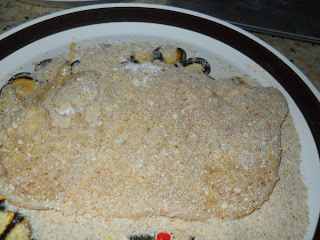 Sift together the bread crumbs, panko crumbs, Parmesan cheese, basil oregano and parsley until well blended. Set three shallow bowls side by side on your counter. 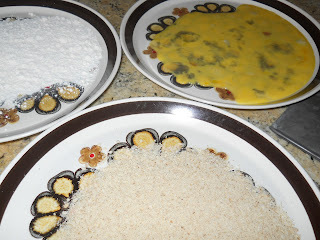 Fill the first one with the flour, the second one with the beaten eggs and the third one with the bread crumbs mixture. Dredge cutlets, one at a time, first in the flour, then in the egg and finally, in the bread crumb mixture. Shake off any excess crumbs and reserve on another plate. 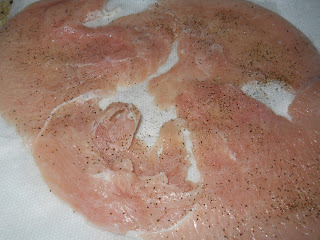 Chill the cutlets in the freezer for about 15 minutes. This will help the coating stay intact when you fry it. Heat a large skillet over medium-high heat and add enough oil to come up about 1/4-inch high. Add butter. Add cutlets and fry until cooked through and golden brown, about 3 minutes per side. Do NOT crowd the pan. If necessary, do this step in batches. 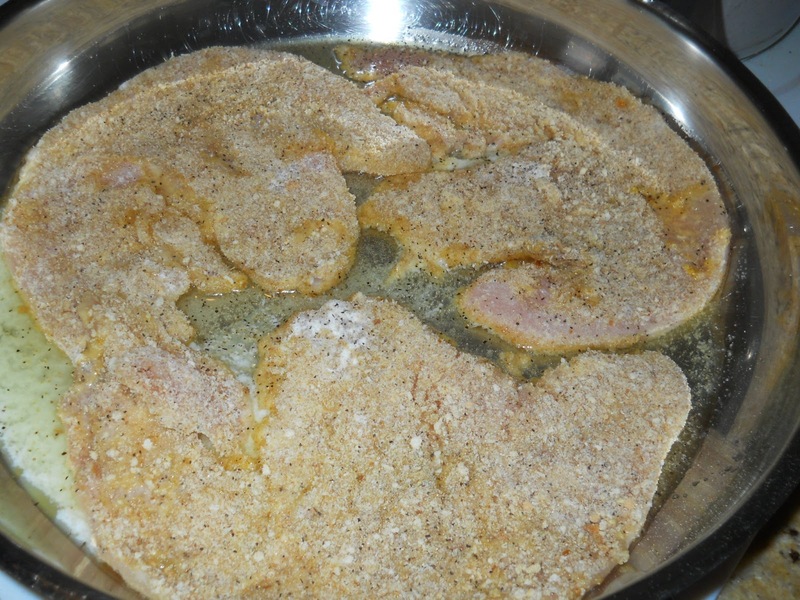 As each cutlet is cooked, transfer to a platter. You can keep the cutlets warm in a low oven. Serve with rice pilaf, mashed potatoes, buttered parsley noodles or some lemon wedges. 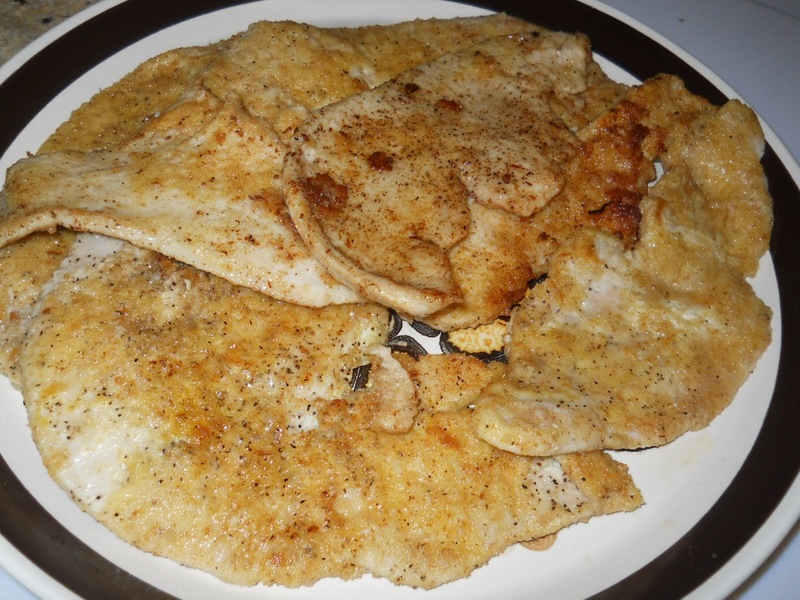 TURKEY MILANESE – QUITE YUMMY ACTUALLY! 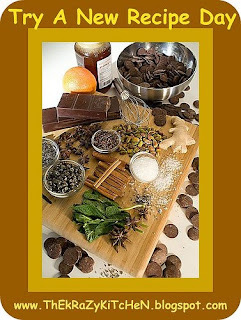 The whole purpose of Taste and Create was, and has been, and continues to be to create a community of bloggers who test each others’ recipes and share links. The participants of the event are paired together and try a new recipe from one another’s blog. 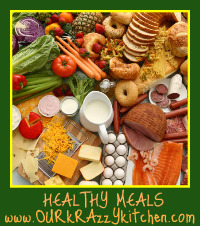 This month my partner is Debbi from Debbie Does Dinner Healthy. Hubby requested Sloppy Joe’s for football food so I decided to try Debbi’s recipe and compare it to my beef version to see if hubby noticed a difference. In a large pan, cook ground turkey. When ground turkey is about half way done, add the veggie and saute along with the ground turkey. Cook until ground turkey is done. Drain if necessary. Season with salt and pepper as they cook. Add the rest of the ingredients and stir to combine. Bring to a boil, reduce heat and allow to simmer for about 10 – 15 minutes. Serve with buns or 100 calorie Arnold Select sandwich thins. Divide into 2 containers for 2 meals. Freeze one for another quick and easy meal. 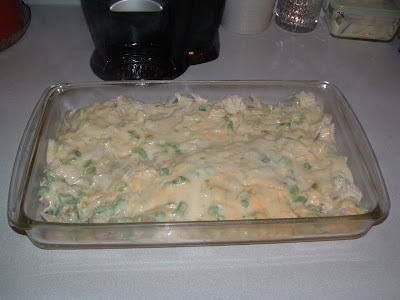 When ready to eat, thaw completely and either warm on stovetop, slow cooker or in microwave. 6 huge servings per container. While Debbi’s recipe tasted great yo me, hubby said he could tell the difference (what is it with guys and their beef?) Next time I’ll try half turkey, half beef and see if he notices a difference. These are always a crowd pleaser. Heat olive oil and add ground beef. Brown beef, onion and garlic. Drain. Add brown sugar, red wine vinegar, Worcestershire sauce, liquid smoke, steak seasoning and beef base. Cook for 5 minutes. Add tomato paste and tomato sauce. Serve on fresh baked buns. Would you try a new recipe for turkey for all your friends and family on Thanksgiving? I would, and I have, and I’ll do it again. But now, I am going to share with you my secret, extra-special turkey recipe, which we make almost every year. In case you’d like to try it!! I have prepared it just about every year for quite some time now, and everyone loves it. (except for the one year I decided to use about 6 bulbs of garlic…yes I said bulbs, not cloves, BULBS…but I don’t want to talk about that right now). It really is delicious. Let me walk you through it. Get a turkey that is big enough you’ll have leftovers. You won’t be sorry. The general rule is about 1 pound per adult, and 1/2 pound per child. So really, my 23-pounder in 2008 was a bit excessive. But I wasn’t sorry, we had tons of leftovers! Generally, with 6 adults and 4 kids, we could have cooked a turkey that weighed about 10 pounds and it would have been fine. Of course we wouldn’t have had the leftovers either…. Thaw your turkey well in advance of when you want to cook it. I mean, buy it about a week ahead, and depending on the size, you’ll want it in the refrigerator (on a tray to catch the juice!) at least four days in advance. This will be a messy process, so make sure you have some space cleared ahead of time. Clean out your sink so you can put the turkey right in there, and have paper towels on a tray right beside the sink so you can dry the turkey. You can then transfer the turkey to the rack and roasting pan. The beauty of this recipe is it’s versatility. You really can use whatever herbs you feel like using. Once I used only rosemary. In the past, I have run across a fresh herb “assortment for poultry,” and have used that. I’ve used several different combinations. Additionally, you can remove the leaves from woody stems, or not. You can insert them whole, or chopped. Whatever you feel like doing is fine. (I usually leave them whole). You can also use different cheeses. I have used blue cheese or gorgonzola or asiago. At the moment I can’t think if I’ve used anything besides those cheeses. But mostly it’s blue cheese because it’s easier to find around these parts. I buy the pre-crumbled containers of blue cheese; the containers are 2″ high and about 4 1/2″ diameter. Get everything ready and in separate bowls. Start with one container of cheese, and have someone standing by to open the next one and pour half of it into the contaminated container so you don’t have to wash your hands more than necessary and don’t contaminate ALL the cheese if you don’t end up using it. Remove the turkey from the packaging, and make sure to remove the giblets package from inside the turkey. If the turkey has a timer insert, you can remove that too, if you’d like. Rinse the turkey inside and out, and dry with paper towels. Transfer the turkey to the rack in your roasting pan. (If you don’t have a rack, that’s okay. Just transfer the turkey to your roasting pan.) I toss the giblets in the bottom of the roasting pan. Starting at one end of the turkey, carefully start loosening the skin from the flesh with your fingertips, without ripping the skin near the end. If you happen to rip some of the skin near the end, don’t worry, it can be fixed. Loosen all the skin you can, reaching your hand/arm in there and loosening the connective tissues under the skin. Again, be careful not to rip the skin too much. But you want the skin to be loose so you can get all the good stuff under there–including up onto the legs and wings, the breast and the back. Loosen all the skin you can on the whole turkey. Now. Grab some cheese with your fingertips, and distribute it under the turkey skin. Just shove it under there, everywhere you can reach. Don’t worry if it clumps, just make sure it’s sort of evenly spaced, and that there is cheese both on the back side and the breast side. Do the same with your herbs (front and back). Whole herbs are actually easier to place than chopped, but either way works. Just do the same thing with the herbs, making sure it looks even under there. I reserve one big herb, like a sprig of rosemary, and put it inside the turkey cavity. Place one garlic clove at a time under the skin, you can slide and manipulate and move the garlic from both under the skin and on top of the skin. The garlic will stick out (hence the “studded” name), and you want these luscious little garlic lumps to be roughly 1 to 2 inches apart (again, front side and back side). And yes, you’ll put a couple under the skin on the legs and wings too, wherever you’ve loosened it, there should be a clove of garlic or two. Once you have the cheese, herbs and garlic under the skin, have someone grab you some toothpicks. You will use these to “sew” together any skin that may have ripped in the process. Remember where the toothpicks are so you can remove them later. Grab your salt and pepper mixture and rub/sprinkle it all over the turkey, top and bottom. Use more than you would think you’d need, and don’t think about it. It will work. Once your turkey is salted and peppered, turn it breast side up on the roasting rack. Fill your roasting pan with about 2 inches of water. And wash your hands thoroughly, up to the elbows. I’m not joking. You will understand once you make this. Bake your turkey as directed on the package. I usually let it bake for about an hour, then loosely drape a sheet of aluminum foil over the turkey. I mean loosely. I just tear it off, and sort of balance it on top, I don’t even mold it to the turkey too much–it’s hot! Roast until a meat thermometer inserted in the biggest part of the thigh registers about 160-170 degrees, then remove from the oven. Keep the foil in place, loosely “tented” over the turkey, and let rest for 15 minutes or more. You can use the juices in the bottom of the pan to make gravy, adding lots of unsalted butter and heavy cream, scraping up all the brown bits and boiling to reduce, and adding a bit of cornstarch if needed to thicken it. It might be a little salty, but it will still taste great. Carefully transfer the turkey to a platter and make sure everyone gets to see that magnificent bird before you carve it up. (don’t forget about the toothpicks!) The skin will be crispy and delicious, the meat delightfully herbed with whole roasted garlic cloves and savory cheese gently spicing it up. Enjoy. And promise your family you will make this turkey for them every single year. When I was a kid and just starting to do the majority of the family cooking we had a set group of recipes that were the “weeknight” recipes. 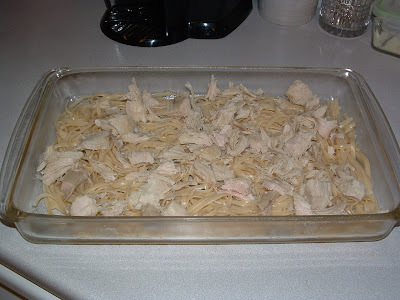 One of those recipes that was especially popular during the holidays was Turkey Tetrazzini. We also substituted ham and chicken for the turkey throughout the rest of the year. Back then I prepared the recipes as they were written and they were okay, but the Tettrazzini recipe used ALL Velveeta and canned mushrooms and stuff I wouldn’t think of putting into my body now so it was my goal to create the same recipe in a more health oriented way, but still easy for a weeknight meal. 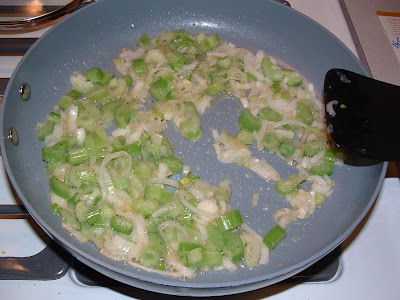 Saute onions and celery just until tender. Add soup and milk, stirring to blend. Cook just until thick. 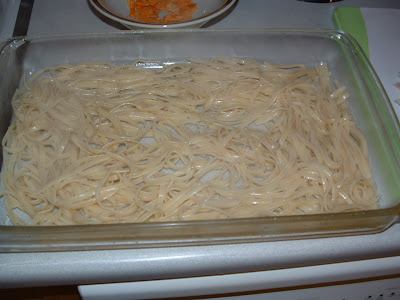 In the bottom of an 11×7 baking dish scatter first the pasta and then the meat pieces. Pour soup mixture over top. Baked Smoked Turkey in a Slow Cooker: What Did You Bake Today? I realize that I am completely pushing the limits of the whole “bake” thing with this post. Hopefully, you will have it in your hearts to hear me out. This is a new technique I learned reading Cheater BBQ by Mindy Merrill and R.B. Quinn. The premise being that slow cookers can act as mini ovens on occasion. By wrapping meat tightly in foil, it doesn’t end up like the typical crockpot stew but stays firm as though it were cooked in the oven. Now, here’s the bad news. This is the only picture I took of the turkey breast. Yep! You have to use your imagination and trust me a Lot! Line the crockpot with foil large enough to completely encase the turkey breast. Place the turkey in the middle of it. Combine the spices and rub them all over the meat, including in the cavity. Combine the butter and liquid smoke and pour it all over everything. Wrap the foil over the turkey, sealing snuggly. Cook on low 6-8 hours or until internal temperature reaches 160 degrees F. I cooked mine for the originally prescribed 10 hours and had a very dry bird. Serve with your favorite BBQ sauce. We only ate half of the meat. With the leftovers, I borrowed another recipe from the Cheater BBQ cookbook…..and I really baked it in the oven.